CHIA SEED OIL – extracted from Chia seeds. Chia Seed Oil is a major source of omega-3 essential fatty acids (up to 65%) and omega-6 essential fatty acids (up to 21%). This causes its effectiveness as an anti-inflammatory, and skin moisturizer, both by external skin applications, and internally, by pouring it over your food. 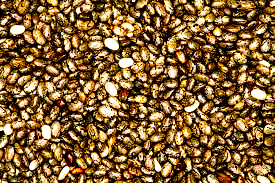 “Chia is the new Flax seed” meaning Chia seeds are an excellent vegetarian source of omega-3 fatty acids. With almost 5 grams per 1 oz serving, chia seeds are a more potent omega-3 source than flax seeds. Omega-3 is essential to balance the body’s high omega 6 content which causes inflammation. This organic seed oil is high in B Vitamins and zinc, both of which help to regenerate tissues, and combat acne and acne scars. The antioxidant and amino acid composition makes it a nourishing addition to anti-aging formulations. You can add Chia Oil to your body moisturizer, to experience true nutrition for your skin. Comb it into the ends of your hair, for no split ends, and glossy hair. All the above benefits, make Chia Seed Oil valuable in restoring moisture, reducing redness, and preventing wrinkles.